3D Instruments, located in Anaheim, CA was founded in 1970 and currently employs 102 employees with diverse backgrounds. The company designs, fabricates, tests and ships a wide variety of high quality pressure gauges in its 35,000 square-foot facility. U.S. military organizations and Fire Departments are key customers. Their annual gross sales are $14 million. Historically, 3D Instruments had a steady increase in sales. However, in late 2007, the company redefined their strategic goals to dramatically increase profit margins and market share over the next several years. To accomplish these ambitious goals, they wanted to improve operational efficiency and create a culture of continuous improvement company-wide. The 8-hour "simulation-based" Lean principles training sessions were conducted for the group followed by a 40-hour exercise to develop a Value Stream Map (VSM) for the distribution product family. A list of improvement opportunities was developed, two 40-hour segments of exercises, and the implementation of improvement opportunities (Kaizen) in both the manufacturing and office work areas were conducted. By using the Kaizen technique, improvements were made in both the manufacturing and office areas. 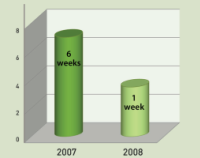 Production lead time in manufacturing was reduced to one week from the original 6-week lead time the company previously had. In the office area, customer service new order lead time decreased by 4 days and helped to reduce the sales order processing time. The project was completed in July 2008. "CMTC has become the true trusted advisor in facilitating our transition to a Lean Environment and becoming more competitive."